Tuesday 20. March 2018 - Debuting in spring 2018, the Adamas solution demonstrates Agfa Graphics continuing commitment to eco innovation. Adamas brings robustness to a whole new level and offers every benefit of chem-free solutions. The most durable chem-free plate available on the market, Adamas boosts efficiency, both in plate throughput as well as in run length, with optimal press performance, zero water and up to 75% less waste compared to similar products. Commercial printers seek cost efficiency and process optimization without compromising on performance. In Adamas, Agfa Graphics brings new technologies to the table that empower printers to deliver high-quality results in less time, and with less waste. To maximize performance, this highly sensitive plate was designed for use with Agfa Graphics’ dedicated Adamas clean-out units. Due to their eco-driven design, they can be simply cleaned with pH-neutral clean-out solution and zero water. Agfa Graphics’ patented ThermoLink technology is at the heart of Adamas. Run lengths as long as 350,000 copies are no challenge for this durable plate. ThermoLink technology contributes to its chemical and mechanical robustness and optimum plate performance. Adamas delivers superb results no matter the application, from commercial sheet-fed and cold-set to heat-set printing. Even more, the plate is perfectly compatible with low-power curing UV inks. No matter how abrasive or demanding the conditions are, Adamas guarantees superior press performance and durability. Receive cutting-edge news from the print industry. 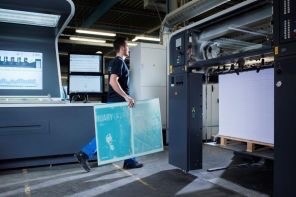 Agfa Graphics enriches wide-format hybrid Anapurna LED series.